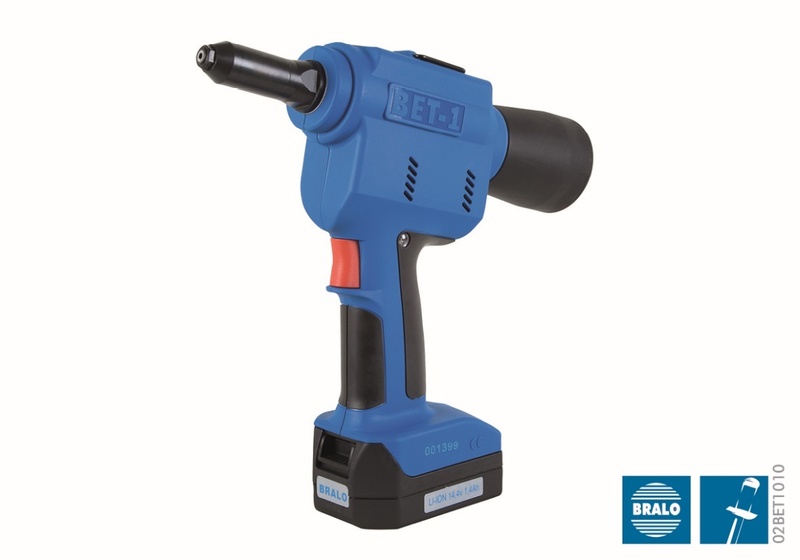 The Bralo BET-1 riveting tool is light weight, easy to use and easily stored. It is portable and has high performance technologies. It is designed to meet the needs of the most demanding applications. The tool has an operating weight of 1500 gr. Can be used both in and outdoors. Riveting capacity of up to 5,0 mm in all materials. Well balanced design for best usage. Minimal effort needed when pulling the trigger. Mandrel collector is easy to dismantle, which ultimately contributes to the cleanliness and safety of the working area. Handle ring enables tool to be hooked onto a production line. The Bet-1 Battery tool is supplied with a solid carry case complete with battery charger. It is available with one or two 1,4 Ah batteries. We can also provide a supplementary 2,8 Ah battery.